There are a lot professional solutions for creating backup out there. Most of them are also quite expensive. All of them work very good and have some strength and weaknesses comparing each of them. A restore function offers each of them. But I'm quite sure most people haven't tested it yet (even if they should, so they know how to do it). Mostly a restore is not that easy and normally requires the installation of the backup software. For smaller backups it's easier and makes more sense to do a simple 1:1 copy of the files to backup. At home you will tend to do a 1:1 backup and burn it on e.g. CD or DVD, i.e. copy the desired files to a save place. CDs and DVDs are said to be quite secure, but to ensure a minimum durability you have to buy those that have been specially developed for this task. But those are really expensive. With the cheaper media you never know how long the data will last on them and remain readable. Usually you will use the cheaper media as you already have them at hand. It is recommended to do backup on various medias and different media types (hard drive, CD, DVD) and store them at different places. In the case of data loss it is usually no problem to download applications again from internet. But it is something completely different topic when you think of your photographs out of several years. If you have problems with your backup media they might all have gone. And that's really annoying. Personally I save my data on DVD, DVD-RAM, external hard drive and one copy remains always on my computer on the internal hard drive. But how to avoid data loss? It is known that data does not stay intact on a hard drive forever or get corrupt on write error or sudden power loss. This happened to me already. JPG images were then corrupt and could not be displayed anymore. There are applications that can e.g. create a recovery file of a DVD (dvdisaster). But this works only with DVDs and the recovery file occupiers plenty of space on the DVD. My assupmtion is that there several copies of one file exist(on different medias). In case a file is corrupt on one media it can then be copied from one of the other medias or a new backup CD or DVD could be created. Basically you need the ability to find out which file is defective. The easiest and commonly used technique is the use of checksums. I created a small tool called Chekker with a size of only a few kBytes. It creates a list with checksums of files found within a directory. Also checksums for files found in subdirectories are recursively created. How to backup: First I create a directory called Daten.Archiv. I copy all the files and directories into it I want to backup. I stop when the amount of data fills up a DVD. Well, I leave at least 1 MByte free (usually more is left). Then I let Chekker create a file Chekker.hash. It contains all the checksums of all files in the current directory and all subdirectories. At last I copy Chekker.exe also into Daten.Archiv. Then I can burn the directory Daten.Archiv directly onto DVD. Of course you should not alter the directory Daten.Archiv on your hard drive any more. If you want to verify all files on DVD or hard drive, simply start Chekker.exe in the backup directory and let it check all checksums. 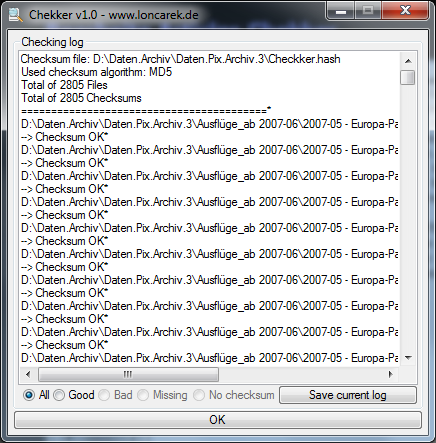 You then get an overview of all checked files, which checksums are correct and which are not or which files miss a checksum. If there is no hash file in the selected directory you can create on. You can select which checksum format should be used: MD5 (standard), SHA1, or CRC32. Result of the check. The hash file for around 2000 files has a size of around 300 kBytes. Here you can see an overview of all files. Of course it is possible to filter the results to those with bad checksum, missing files, or missing checksums. Chekker is available for free and may be distributed and copied. Commercial and private use is explicitly allowed.